*ATAR605 God of creation gentle life-giver (Craig Mitchell) Simple and lovely Trinitarian words to the tune BUNESSAN. I particularly like the phrase "stand with your people, whisper among us" when talking about Christ. Lyrics. New words to old tunes. *HiOS033 Glorious are you (Colin Gibson) Beautiful words about the Trinity; wonderful images. The tune is new, and will need to be taught, but is light and joyful. "You are the symphony of the stars and planets, you are the music of the atoms within us"... I will suggest this again next week. VU322 O God whose first creative word (Judith Fetter) Good Trinitarian words with lovely imagery. Sung to a simply old hymn tune. MELITA New words to old tunes. *Online Resource God of creation Lord of all beauty (Thom Schuman) A different set of words also set to BUNESSAN. I like this one too. Lyrics. New words to old tunes. 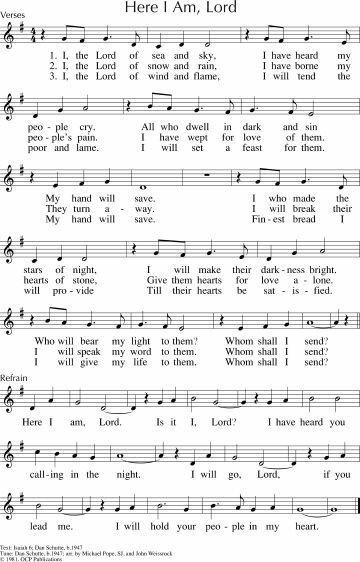 NCH278 / Cha062 / URW198 Creator God creating still (Jane Parker Huber) Excellent hymn of hope for the future sung to a well known tune (ST ANNE). Lyrics and a critique. New words to old tunes. TiS 179 / NCH273 / VU312 / GA379 / StJ / URW073 Praise with Joy the World's Creator (John Bell & Graham Maule) One of my favourite hymns - strongly Trinitarian lyrics and excellent imagery. I particularly love the “One God in community” phrase. Some versions change "Son" to "Christ" to make it more inclusive. Lyrics (scroll down). New words to old tunes. *NCH355 / UMH648 / VU514 / GtG303 / PH523 / W&R149 / Cha450 God the Spirit guide and guardian (Carl Daw) Excellent, inclusive Trinitarian lyrics of God's guidance and blessing on leaders in the church community. Set to a variety of well known hymn tunes including HYFRYDOL (my favourite! ), JEFFERSON, BLAENWERN and BETHANY. Lyrics and sheet music. New words to old tunes. *NCH274 / CH118 / SFFS 2046 / GTG003 / CP390 / Cha014 Womb of Life and source of being (Ruth Duck) Feminine trinitarian imagery. An easier tune, listed in some hymnals is IN BABILONE. New words to old tunes. Others have LADUE CHAPEL which is a little less intuitive. Lyrics and sheet music. G(II)331 / GC472 / GC(II)488 / G(3)563 How Wonderful the Three-in-One (Brian Wren) Stunning words sung to an old American Shape Note melody. New words to old tunes. Melody line, chords and lyrics. StF008 God with us: Creator Father (Alan Gaunt) Trinity More good words for Trinity Sunday, to the familiar tune ODE TO JOY. New words to old tunes. *URW126 Give thanks to the Source (Ruth Duck) Excellent words to a lovely lilting tune. TiS 182 / AoV2-010 / NCH11 / CH134 / VU268 / GtG760 / SFFS 2047 / HPP13 / CP395 / VF106 Bring many names beautiful and good (Brian Wren) This is a beautiful song, but it's very long (especially if sung too slowly). Try singing one verse unison, then one women, one men, then all together again, to keep people interested in what they are singing. Lyrics and sheet music samples. AoV2-084 Father and Mother Creator And Poet (Sandra Sears) Trinitarian song with a Creation focus. Sound sample and lyrics. VU324 / AA078 / URW426 Jesus come to our hearts (William Worley) A simple devotional song, with images of God in nature. *FFS47 Maker of mystery (Marnie Barrell) Feminine trinitarian imagery. Tune is not hard, but can also be sung to the more familiar DOWN AMPNEY. New words to old tunes. PH135 / G(II)333 / GC476 / W&R139 God Is One Unique and Holy (Brian Wren) Good words focussed on God's unity although many-faceted. Inclusive and great imagery. The tune is quite simple. Lyrics, sheet music sample and tune sample. *MV043 / GtG009 / GC(II)484 / G(3)564 The play of the godhead (Mary Louise Bringle) Lovely words and a very simple, intuitive tune. "The play of the Godhead, the Trinity's dance, embraces the earth in a sacred romance". Lyrics, sheet music sample and fairly plain and slow tune sample. *G(3)561 Holy and blessed Three (Paul Melley) This is a pretty cool new setting to the old words by John Marriott. Sound sample. Lead sheet. StF007 God who made the stars of heaven (Ruth Duck) Good words, the tune is a little tricky, but quite lovely. CP(E) 463 Holy Trinity of Love (Alan Gaunt) Good solid words. Recorded Music Sweetest Mystery (Malcolm Gordon) A lovely song about being part of a Trinity Community. Listening and purchasing options here. 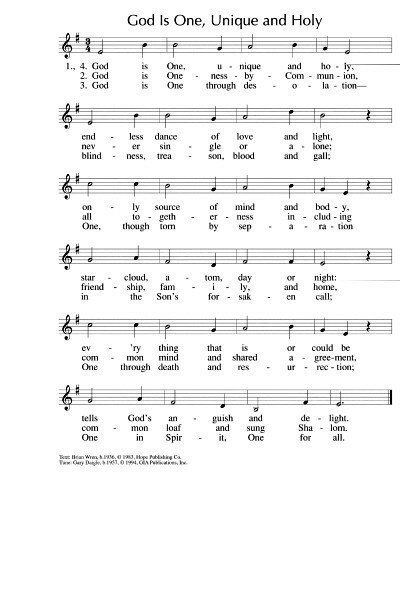 SP&P121 We are all one (Tom Rasely) This simple song has a Trinitarian message of unity. One in God. One in Christ. Come Holy Spirit. Quite simple to sing. *AoVK-30 / ATW 419 / Iona (Common Ground, CAYP) / CH757 / MV002 / WoV717 / ELW819 / GtG388 / A&M361 / SFFS 2274 / HPP551 / GC(II)744 / G(3)849 / PfAS066B / SP&P022 / SP179 / StF022 Come all you people (Uyai mose) Joyful and pretty easy really for the congregation. If you have WoV or SP&P, they each have a nice Trinitarian version of this. Come and praise the "Most high" / "Saviour" / "Spirit". Sheet music. Good for kids. STB286 O most holy o most holy (Sri Lankan, paraphrased by Shirley Murray) This is a traditional Sinhalese (Sri Lankan) worship song. 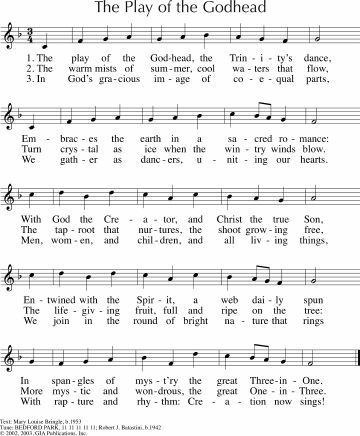 If you want to sing all the verses (one for each member of the Trinity, plus one for all three! ), I would suggest singing just in English, unless you have Sri Lankans in your congregation. Alternatively, you could choose a single verse to sing in Sinhala. Sound sample in Sinhala and Tamil. MV056 / STB001 O Come let us praise / Lajahle htaora Hp'ya (Saw Gideon Tun Shwe) A good song from Burma. Quite beautiful - will need to be taught to Western ears. Sheet music. Angels call the enthroned God Holy, bringing release from sin; God asks who will go. The prophet is unworthy, but says “Send me”. 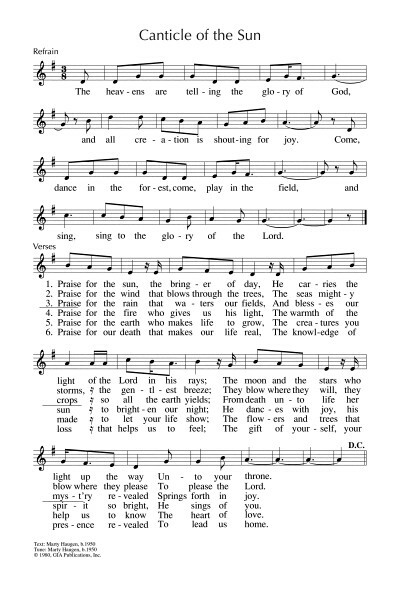 You might also like to sing a Sanctus (Holy Holy): Here's a list! GtG068 Heaven opened to Isaiah (Rwandan) A very simple and joyful song from Rwanda. You could also just use the chorus on its own. Fairly ordinary, but helpful sound sample. TiS 693 / AoV1-031 / GA212 Come as you are that's how I want you (Deidre Browne) Isaiah didn't feel particularly worthy either... This song is beautiful, gentle, simple, and very well known. Lyrics and sound sample. A good song to start the service. Recorded Music Sweetest Mystery (Malcolm Gordon) "Holy holy holy Lord, is the God who raises us to this family of love". Sound sample and purchase options. AoV2-015 / Iona (M&G) / CH773 / MV189 / StJ / ELW529 / SFFS 2273 / GtG392 / G(II)502 / GC705 / SP&P044 / W&R659 / ZSS148 / StF027 Jesus we are here / Jesu Tawa Pano (Matsikenyiri / Zimbabwe) Simple and fun. Much better in the original Shona text (rhythmically speaking) but works OK in English. Good for kids. VU575 / SFFS 2153 / GtG700 / PH369 / SP&P139 / W&R574 / Cha614 I'm Gonna Live So God Can Use Me (African American traditional) Good simple tune and meaningful words. Easy to sing and play around with. Good for kids, non-readers and for people for whom English is a second language. *TiS 658 / AoV1-090 / ATE 296 / CH251 / UMH593 / VU509 / WoV752 / ELW574 / GA496 / A&M494 / HPP541 / GtG069 / PH525 / G(II)492 / GC(II)671 / G(3)777 / CP(E) 470 / W&R559 / Cha452 / Srce328 / Lau865 / StF663 / MP857 I the Lord of sea and sky / Here I am Lord (Dan Schutte) Song of God searching for us and our response. Very slow sound sample. Lyrics and sample sheet music. W&R584 / Cha454 Come Celebrate the Call of God (Brian Wren) Good words to a lilting intuitive tune. This song is written to recognise a commissioning or the gift of a particular person's call, but it can also be sung with "our" instead of "her" to make it a song for a whole congregation to recognise their own call. Lyrics and sheet music. *TiS 674 / Iona (Common Ground, Heaven Shall Not Wait) / A&M562 / CH253 / SP245 Inspired by love and anger (John Bell) Powerful lyrics, simple English folk tune. Lyrics (search for "inspired"). I love verse three “Don’t query our position! Don’t criticise our wealth! Don’t mention those exploited by politics and stealth!”. It’s easy for us to be judgemental on these things. *TiS 132 / AHB 65 / NCH277 / CH651 / UMH64 / VU315 / LBW165 / ELW413 / A&M276 / HPP243 / GtG001 / PH138 / G(II)332 / GC475 / GC(II)483 / CP001 / CP(E) 202 / W&R136 / Cha004 / Srce243 / 82Hml-362 / Lau468 / StF011 / MP237 Holy, Holy, Holy, Lord God Almighty (Reginald Heber) Old other-worldly language, but a surprisingly inclusive (in most hymnals) classic, and a great rousing hymn tune. Different resources have slightly altered lyrics. A surprisingly non-inclusive sample can be found here. Oldy-but-a-goody. TiS 180 / UMH105 / W&R58 / Cha013 God of many names (Brian Wren) If this is new it will need to be taught to your congregation as the tune is not intuitive, but it is worth knowing. The chorus is particularly appealing to kids. Lyrics and sheet music. *GtG596 You are holy you are whole (Per Harling) An adaptation of the above song - the last few lines have been changed to say "Sing Hosanna in the highest, sing Hosanna, sing Hosanna to our God"; makes it much more like a Sanctus. Lyrics. Good for kids. Psalm 29God's voice in the thunder. Quite a thunderous Psalm! Wind and flame, earthquakes and floods. TiS 465 / AHB 399 / ATA 115 / NCH279 / A&M271 / Iona (SBL) / CH116 / GA381 / Lau313 / StF004 Our God in heaven / Father in heaven / Loving Creator grant to your children (Elena Maquiso / Daniel Niles) I really like this hymn, especially the Philippino folk melody to which it's set. Newer versions of the hymn from the Christian Conference of Asia have altered the lyrics to "Our God in heaven / Creator God" in the first verse. Other versions, such as CH4 have "Loving Creator / Parent and God". *NCH Psalter 29: The voice of God is full of majesty (Bob Hurd). A very simple and beautiful refrain with a paraphrase of the Psalm that is inclusive without losing any of the majesty of this Psalm. Can be used with a reader or cantor. Highly recommended. Being led by the Spirit and God’s adopted children. See also the songs suggested for the Acts reading. Tune In: Father of Earth, Mother of Sea (Dave Brown) A latin-rhythmed song about the Spirit being with those who are victims, prisoners and the sick, as well as present in our prayers. Free downloadable song book. Tune In Making things new (Sheree Anderson) A simple pop/rock song. “Take hold of the hope that I give, trust in me, reach out for the love you can live, eternally”. Good for kids. BUC Song Project Drive us out (Shawn Whelan) A spirited and lively song about being driven to new places by the Spirit. Taizé / TiS 747 / ATE 214 / Iona (M&G) / GtG842 / PfAS027A / URW393 The Lord is my light, my light and salvation (Jacques Berthier) A simple and very popular Taize chant. 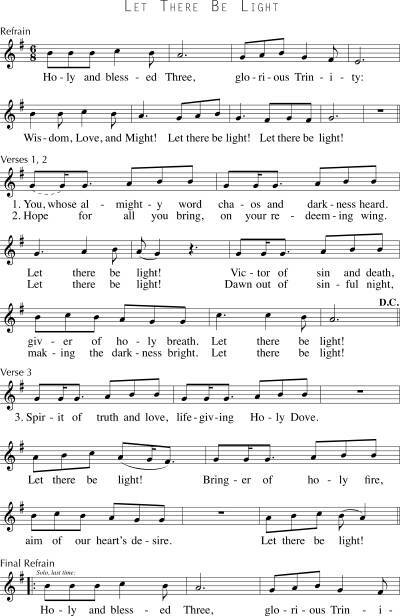 Note that this is really easy on recorder if you have a kid in your congregation who is learning it. Good for kids. Youtube. NCH057 / VU379 / WoV688 / LBW459 / ELW399 / SFFS 2121 / CP(E) 188 / Cha251 / URW079 / VF055 O Holy Spirit root of life (Jean Janzen) Good words from Hildegard of Bingen of "Holy Spirit","Eternal Vigour" and "Holy Wisdom". I like the phrase "encompass us with wings unfurled". Simple known tune (PUER NOBIS). Lyrics. New words to old tunes. TiS 465 / AHB 399 / ATA 115 / NCH279 / A&M271 / Iona (SBL) / CH116 / GA381 / Lau313 Our God in heaven / Father in heaven / Loving Creator grant to your children (Elena Maquiso / Daniel Niles) I really like this hymn, especially the Philippino folk melody to which it's set. Newer versions of the hymn from the Christian Conference of Asia have altered the lyrics to "Our God in heaven / Creator God" in the first verse. Other versions, such as CH4 have "Loving Creator / Parent and God". TiS474 / AoV1-012 / ATE 295 / CH623 / SFFS 2236 / HPP553 / A&M363 / GtG401 / G(II)539 / GC839 / GC(II)743 / G(3)848 / CP465 / W&R649 / Cha284 / SP175 / URW054 / Lau475 / LUYH529 Here in this place new light is streaming / Gather us in (Marty Haugen). Excellent words, very well known. “Nourish us well and teach us to fashion lives that are holy and hearts that are true”. Lyrics and lead sheet. TIS 415 Praise the Spirit in creation (Michael Hewlett) Amazing words. Tune is unfamiliar, but good. *MV157 I am a child of God (Bruce Harding) A simple song with powerful words. Very easy to learn. I would just sing the first verse this week, as a round. It's important to remember that God speaks through children. Good for kids. TiS 178 / G(II)335 / GC478 / GC(II)487 Praise the God who changes places (Brian Wren) I like the joy of the tune written by William Rowan (BOE) for this song. Newer versions have "Friends, be strong!" instead of "Friends, stand strong" to make it more inclusive. Lyrics. GtB God is love and love is giving (Ross Langmead) A simple kids' song about God's love. A round. We love this! Good for kids. *NCH297 / CH736 / VU706 / StJ / AA45 / HPSS528 / W&R518 / Cha649 / URW131 Give thanks for life the measure of our days (Shirley Murray) This song is also good for funerals and is sung to the familiar tune SINE NOMINE. "Give thanks for life, the measure of our days, mortal we pass through beauty that decays, yet sing to God our hope, our love, our praise: Alleluia, Alleluia!". Lyrics (scroll down). New words to old tunes. Online Resource / Tune In In the shape of a cross (Dave Brown) A cry to God for help and a call for God to enter our world. Free downloadable song book. TiS 242 / AHB 183 / AoV1-018 / ATN 27 / CH404 / UMH261 / VU352 / A&M667 / HPP163 / GtG157 / PH302 / G(II)481 / GC708 / GC(II)689 / G(3)796 / CP(E) 468 / W&R118 / Lau765 / StF247 I danced in the morning / Lord of the Dance (Sidney Carter). Lyrics and tune sample. You all know this one, right? Good for kids Oldy-but-a-goody. *Taizé / CP530 By night we hasten in darkness / De noche (Jacques Berthier) One of my favourite Taize chants. Sheet music, lyrics, translations and sound samples. *Online Resource Holy Holy Holy One (Richard Bruxvoort-Colligan) An energetic rocky song about God's love. Sound sample, lyrics etc. *Taizé / MV100 / Lau782 Lord God you love us, source of compassion (Jacques Berthier) A very simple refrain, which would work well as a response during prayers of confession or of intercession. Sound sample, sheet music and translations. NCH271 / UMH538 / VU196 / PH131 / CP249 / W&R333 Wind who makes all winds that blow (Thomas Troeger) Excellent words. Familiar tune (ABERYSTWYTH). New words to old tunes. Various Sources Blowin' in the wind (Bob Dylan) Thanks to Ed in LA for this suggestion. "The wind blows where it will". This could be a good song to add to this reading. Recorded Music You must be born again (Mahalia Jackson) A good old song - if you have good musicians, they could do their own version of this classic. Lyrics and Youtube. What will you be singing? Please add a comment below to share your thoughts with other readers. Written in Incheon Airport, after visiting the DMZ at the border of North and South Korea.